The constellation Volans. Roll mouse over to see labels. Volans is a small, faint constellation, visible in the far southern evening sky in the months around January. The name ‘Volans’ is short for ‘Piscis Volans’, Latin for ‘flying fish’. It represents a real species of fish which can jump out of the water and glide on wings over distances of around 50 metres. 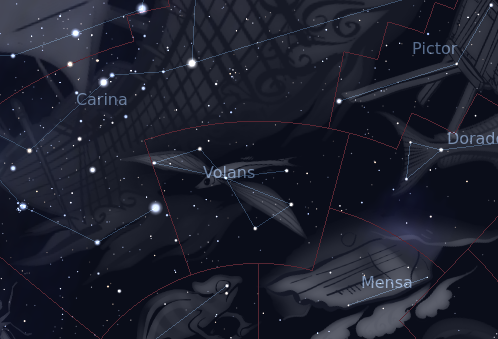 Volans is among the dozen constellations introduced by Pieter Dirkszoon Keyser and Frederick de Houtman which celebrate rare or exotic animals, and it first appeared on star maps in 1598. It does not contain any stars brighter than mag 3.8, and its only deep sky objects are faint galaxies. 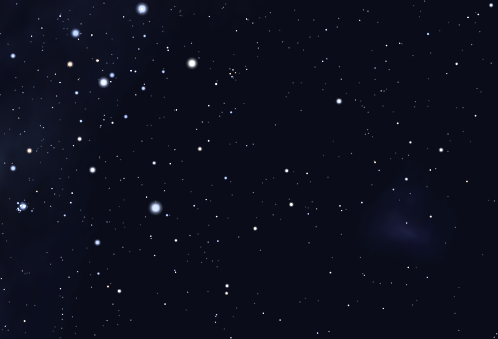 The following constellations neighbor Volans: Carina, Chamaeleon, Dorado, Mensa, Pictor.